And then there were ten. With a completely expected shoo-in for JFG like the Porsche 959, the margin of acceptance standing at 95.1% is no surprise. Impressive yes, but still bested by the McLaren F1 and the Mercedes 300SL, though we suppose that to be good company to keep. Today's offering is far less well known, with a far murkier history, and much, much more beautiful coachwork. What the bloodlines of the recently axed Rolls Royce Phantom cannot offer is everything this car represents. Complete and utter disregard for cost, opinion, standard, and precedence. This automobile set a benchmark we doubt will ever be reached again in within our lifetimes; the 1925 Rolls-Royce Phantom 1 Jonckheere Coupe. With this car, it's easy to draw comparison to Aristotle's model of the tragic hero. The tragic flaws are not in its character but in its history. It is not for lack of greatness but for the existence of those flaws that this car will never win the Concourse d'elegances. That, among many reasons, is why we offer it a place in our garage, with no questions as to its veracity. Such glorious things rarely start life in such a perfected state, and thus is true for this Phantom. The 1925 Phantom 1 was originally bodied and sold as a Hooper Cabriolet to one Mrs. Hugh Dillman of Detroit, MI. Amusingly enough, it seems the car never left England before it again changed hands and was purchased by the Raja of Nanpara. It was at this point that the Rolls discovered its true fate at the hand of the Belgian coach builder Jonckheere Carrossiers. The car was rebodied in the entirely fabulous hand crafted aero-coupe livery you see today. The work won many awards, including its first concourse entry in le Prix de Cannes, where it won top honors. The details of this car go on for miles and we'll take time to point out only a few highlights. The automobile was fitted with a six cylinder, 7.66L OHV inline six engine and a four speed manual transmission. The body was completely hand fabricated to include round doors, split-opening half-moon windows, twin sunroofs, bespoke luggage and a stabilizing fin at the rear. All told, the luxurious automobile was quiet enough to hold a conversation at speed and would easily travel at 100 mph. As with all stories in this form, tragedy strikes early in the tale. Though vast sums had be spent on the car, it changed hands repeatedly within the 1940s and 1950s. It was eventually purchased by an American, Max Obie, when in near-derelict condition. He covered it with over six pounds of gold dust paint and used it as a traveling sideshow; any schmoe with a dollar could pay to marvel at its bastardized glory. And then it was lost to time. In 1991, the car again emerged from its historical haze by way of international auto auction. 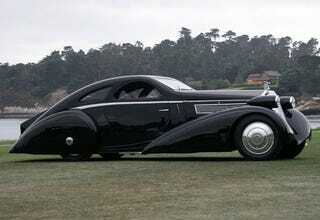 The Phantom 1 Jonckheere Coupe was purchase by a private Japanese collector and stashed away for time to pass it by yet again. Here is where the story both diverges and follows the model of tragedy. Instead of descending into obscurity, the Petersen Museum convinced the collector to relinquish ownership and it became ward of the institution. It was promptly restored to is original glory and shown in the 2005 Concourse D'Elegance, where the final tragedy occurred. Because of the lack of provenance, the fates (and the judging committee) would not allow a best in class to be bestowed upon this lustrous wonder. The best it would do is the Lucius Beebe Trophy, awarded to the finest Rolls entered into the show. With all that, we'll lay the choice with you. Whether tis nobler to suffer the slings and arrows of outrageous fate, and in doing so rank among the members of Jalopnik Fantasy Garage, or failing that, be cast off into the abyss yet again.